Spring is finally here! 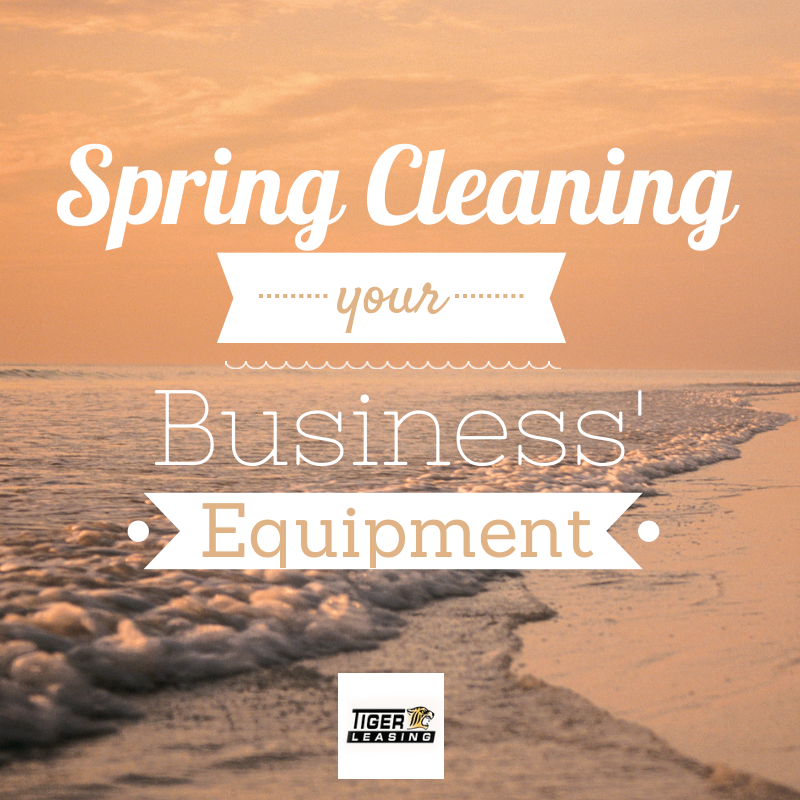 Roll up those sleeves and grab a broom because it is time to spring clean your business’ equipment! If you have been frustrated with obsolete technology and outdated equipment this winter, it may be time to lease. When you lease equipment through Tiger Leasing, you receive the most efficient, updated technology, along with the best equipment, for a cost effective price. Sometimes, you just need to shake the dust loose to see there are better options available for your company. We’ve put together a spring cleaning checklist so you can focus on making your business the best it can be. Office Furniture – Does your waiting room or reception area need a facelift? These spots are your only chance to make a first impression, why not wow your customers with a fresh look? Leasing office furniture is a great way to revive your office, without spending a ton of money. Computer Systems – From hardware to software to training and beyond, Tiger Leasing can structure a computer financing solution specifically for your business. Whatever technology solutions you need, Tiger can help. Plus, with a lease, you won’t be stuck with outdated equipment when the lease is up! Business Equipment – Whatever your business needs to grow, Tiger Leasing can help you acquire. Learn more about our various equipment leasing programs, or contact a Tiger Leasing representative today for more information! With a little help from Tiger Leasing, your spring cleaning doesn’t have to be difficult, or expensive. Whatever your business needs in terms of equipment and technology, we can help with. Don’t let this opportunity for spring cleaning pass you by! Make the most of this time and inventory your needs and create a wish list for the Tiger Leasing team! Our innovative, cost effective financing programs are sure to be the right solution for your business this spring! We provide a prompt, straightforward financing programs for your customers and prospects. Our innovative leasing programs allow customers with a variety of budgets and equipment needs the opportunity to acquire your equipment, even if they thought you were out of their price range. Our flexible payment options can help you close more deals. We offer Leasing Sales Training, to help you better understand all of the opportunities and benefits equipment leasing has to offer. From increasing transaction size to better qualifying prospective customers, Tiger Leasing can help you become more profitable! Our Customer Sales Assistance program means that an experienced, qualified Tiger Leasing team member is available to you to handle those critical negotiations. Equipment leasing isn’t your specialty, it’s ours. Our team is ready and waiting to help you offer personalized service and extensive knowledge to your prospects whenever you need us. LeaseQuote™ 2.1 can be put to work for you. Tiger Leasing offers this tool to our equipment vendors so they are able to instantly generate a leasing proposal for a qualified lead. Just type in the equipment cost and LeaseQuote™ automatically calculates monthly payments for lease terms from 12 to 60 months. We can customize this sales tool for your company’s branding, too! Our quick and easy financing solutions along with an easy credit approval process and our knowledgeable staff set Tiger Leasing apart from other leasing companies. We review every lease application submitted to better understand the program and overcome any potential glitches that could negatively impact the program in the future. When you work with Tiger Leasing, you gain a partner and industry collaborator, committed to helping you succeed. Learn more about our vendor sales tools or contact Tiger Leasing for more information on how we can help you close more sales, today! Spring has sprung! The short and cold days of winter and snowy weather are melting away to longer days with more sunshine and rising temps. 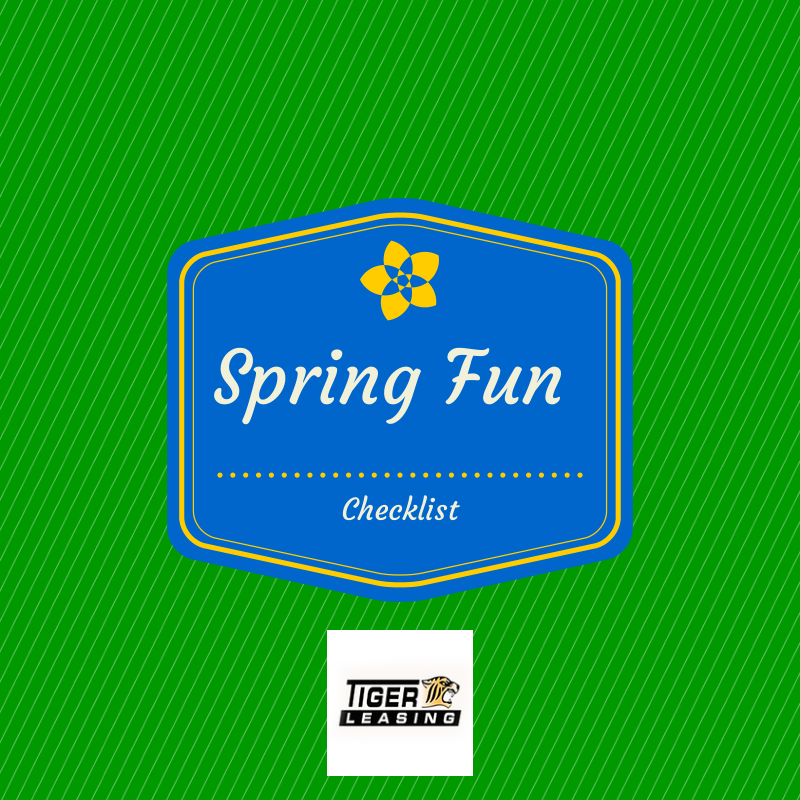 After months of being indoors it might be tough to transition out of hibernation mode, so the team at Tiger Leasing put together a list of fun activities that will help you get in the swing of spring and enjoy the season. So organize some coworkers or get your friends and family involved and make the most of the new season! Garage Sale: Having a garage sale may not be at the top of your spring to-do list, but you may want to consider it after you take on spring cleaning. Having a garage sale is a simple way to clear out old clothes, books, knick knacks and other items you uncover and make a little extra cash. Plant A Garden: If you have room in your yard, try planting a garden! There are many vegetables you can plant in spring, including potatoes, spinach, onions, lettuce, peas, kale and carrots. There’s nothing better than having fresh veggies to cook with. An office garden is a great way to get your employees or team members eating healthier and watching those flowers grow can be great team-bonding! Walk or Run Outside: After a long day at the office, it’s nice to be able to get outdoors and get some physical activity in. A walk or a jog gives your body the exercise it craves and is a simple way to enjoy gorgeous spring evenings. If you can, a quick walk at lunch is another great way to get re-energized and re-focused during the workday! Take A Trip To The Zoo: Heading to the zoo never gets old. Gather your family or friends, some snacks and the camera for a fun-filled day at your local zoo. Keep your eye out for discounts or coupons, as many zoos have reduced admission days in spring. Organizing an office trip is another great way to keep the team strong and laughing together for better employee morale and overall productivity! Community Events: From benefit walks to volunteer opportunities, many communities have a variety of activities to get involved with during spring. Look on your city’s website or in its newspaper for upcoming events you may be interested in. This is another great way to get your employees or team out and about together, supporting the community! If you can sponsor or donate to local events, you could also get some publicity and good PR for your business as well! Go For A Bike Ride: You’re never too old for a bike ride! Whether you prefer to ride on trails or would rather stick to the streets, a bike ride is a great way to enjoy a beautiful spring day. Is your commute a manageable one? Consider biking to work as well, get in a great workout while doing something good for the environment, too! Have A Picnic: If you’re not sure what to do on a sunny Saturday afternoon, why not have a picnic? Pack a basket of tasty foods, grab a friend or the family and head to the park to soak up the great outdoors. Look for spots around your work place for a weekday picnic with coworkers, as well! Read A Book Outside: Sometimes lazy days are the best. On your days off, when you just want to relax, head outside with a good book and read. Head To The Ballpark: Spring means it’s time for baseball to begin again. Whether you’re a baseball fan or not, it’s safe to say that a day spent with friends and family at the ballpark will be a good time. Rainy Day Movie Marathon: It’s true, April showers bring May flowers. On days when you can’t get outside due to rainy weather, kick back, relax and have a marathon of your favorite movies. Did we miss any of the musts on your to-do list for the spring? Feel free to share them with us in a comment, on our Facebook page, Google+ page or Tweet us! Happy Spring!